On December 22, 2018, a tsunami devastated the Sunda Strait in Indonesia’s Banten and Lampung regions. The tsunami was triggered by the Anak Krakatau volcano, which has been spewing ash and lava for months. On December 22, a 64-hectare (158-acre) section of the volcano’s southwest side collapsed into the sea, an Indonesian official said. People living in coastal areas reported not seeing or feeling any warning signs before the high waves arrived. 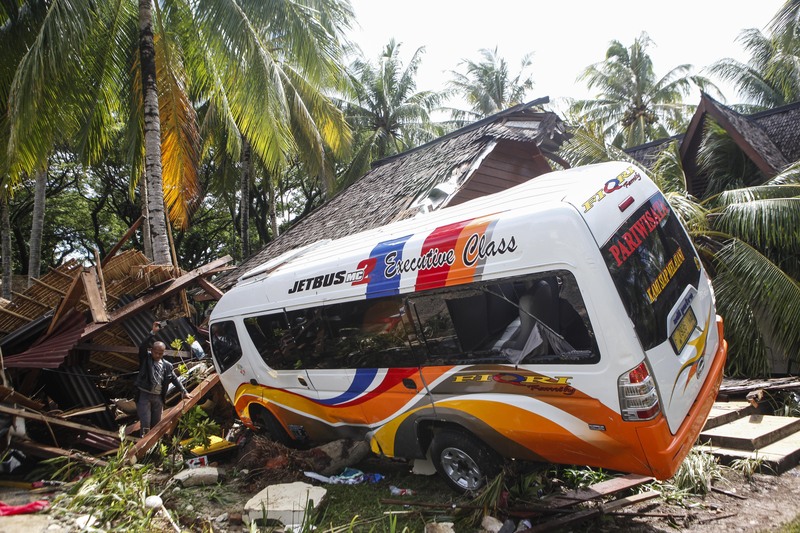 According to the Indonesian National Board for Disaster Management (BNPB), as of December 25 as many as 429 people died, 1,459 were injured, and 154 people were missing as a result of the tsunami. 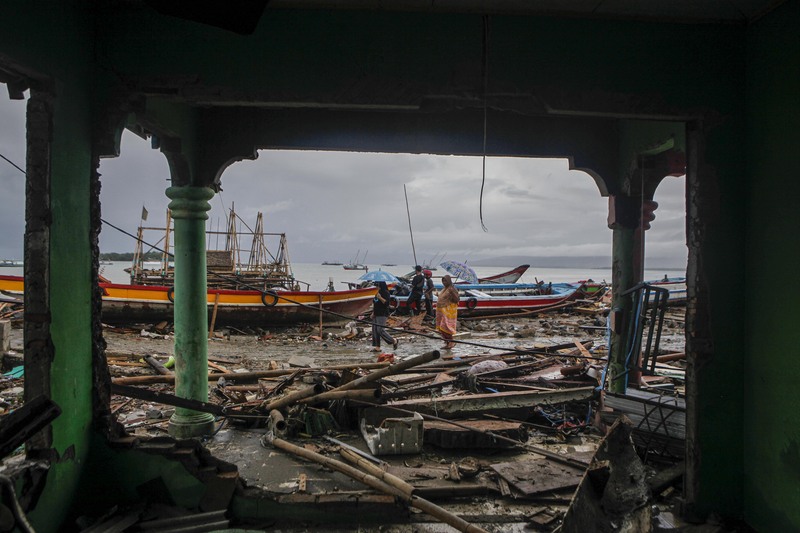 Physical losses include damages to 681 housing units, 69 hotel and villa units, 420 boats and ships, 60 stalls and shops, and dozens of damaged vehicles. 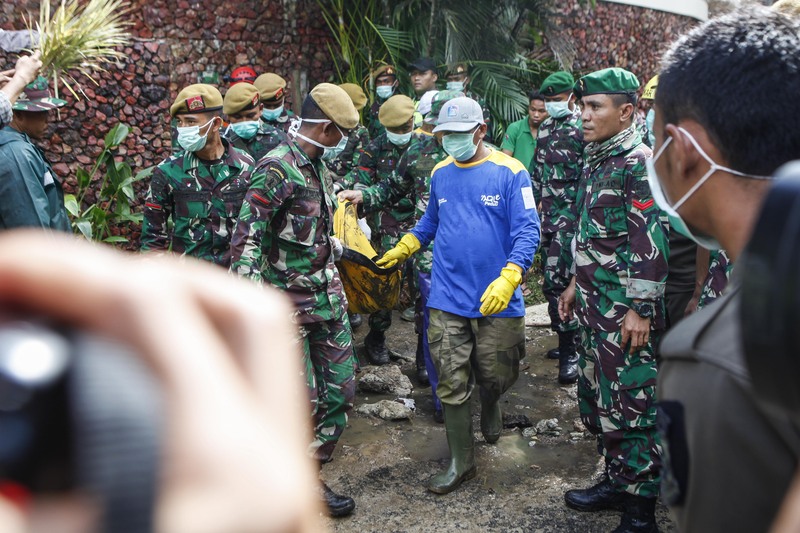 Hundreds of rescue team members continue to search for tsunami victims along the Sunda Strait while authorities warn that additional tsunamis are possible as the volcano continues to erupt. One of the hardest hit areas was the Pandenglang district, a lively beach tourist area with hotels and villas lining the coast. The tsunami occurred during a long holiday and the area was packed with people. The absence of tsunami early warnings caused a significant number of casualties because the community did not have the opportunity to evacuate before the wave arrived. The Meteorology, Climatology and Geophysical Agency (BMKG ) detected Anak Krakatau volcano erupting several times before the tsunami. 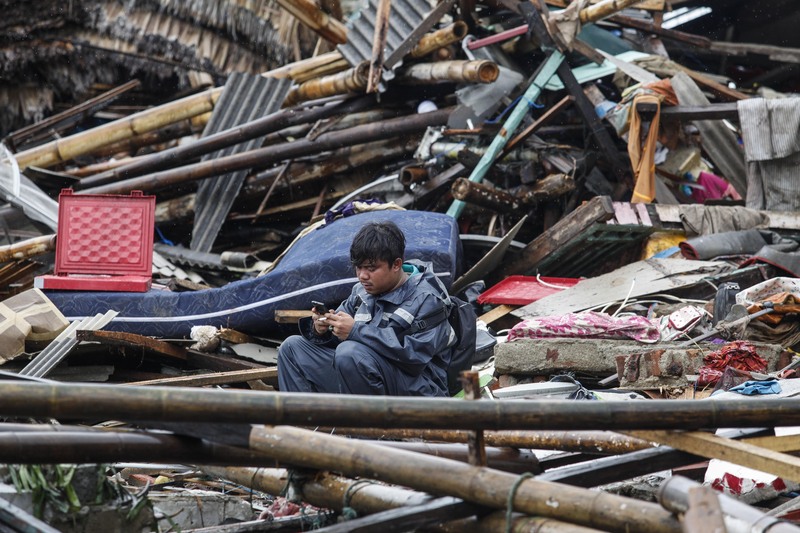 In October 2018, an earthquake triggered a tsunami that struck Central Sulawesi, killing an estimated 2,100 people. 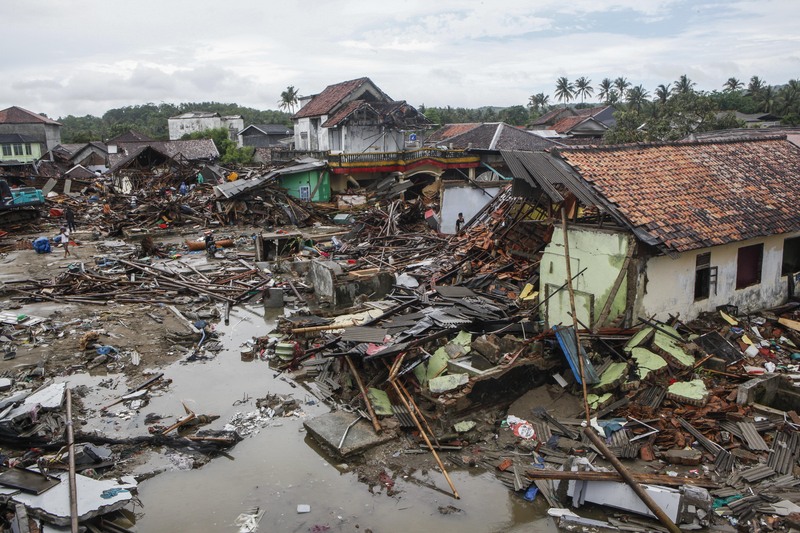 The Sunda Strait tsunami occurred days before the anniversary of the devastating 2004 Indian Ocean tsunami that killed approximately 230,000 people across 14 countries, including more than 130,000 in Indonesia. 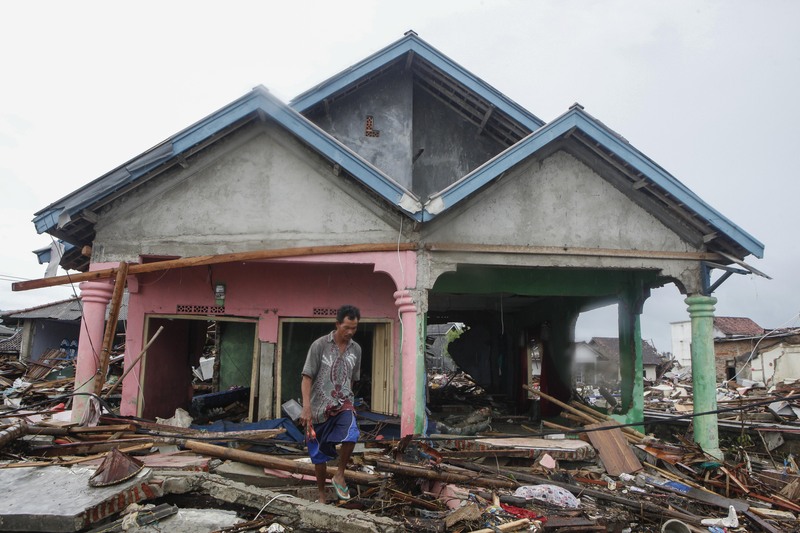 A man walks in front of destroyed houses in a tsunami-ravaged village in Sumur, Banten. 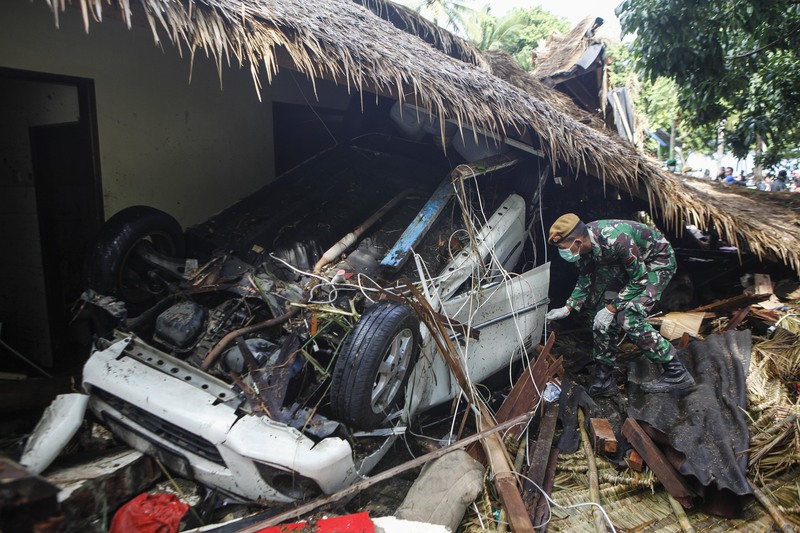 A rescue team member searches for victims at a luxury resort in Tanjung Lesung, Banten. 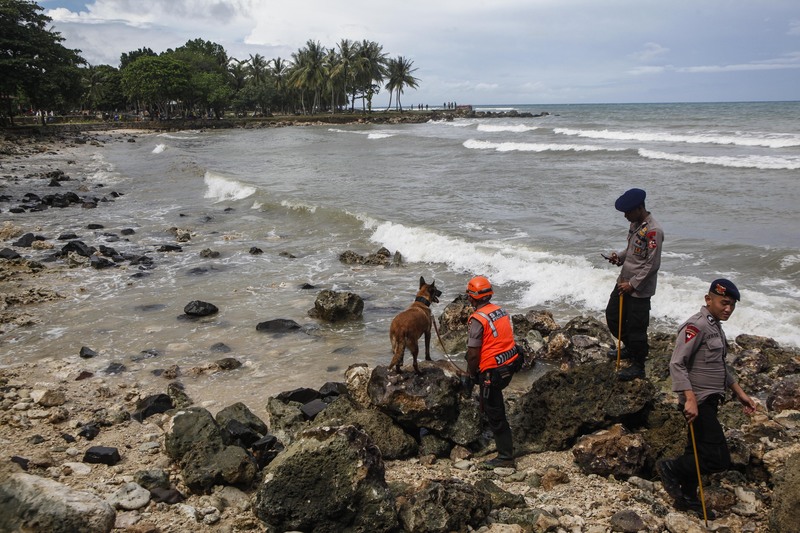 A rescue team searches for victims at a coastal area in Tanjung Lesung, Banten. 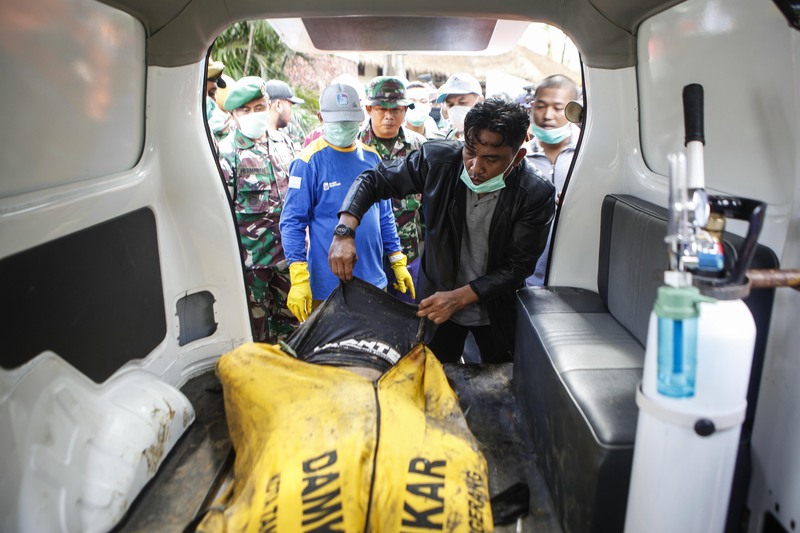 A rescue team evacuates the body of a victim after a tsunami hit in Tanjung Lesung, Banten. 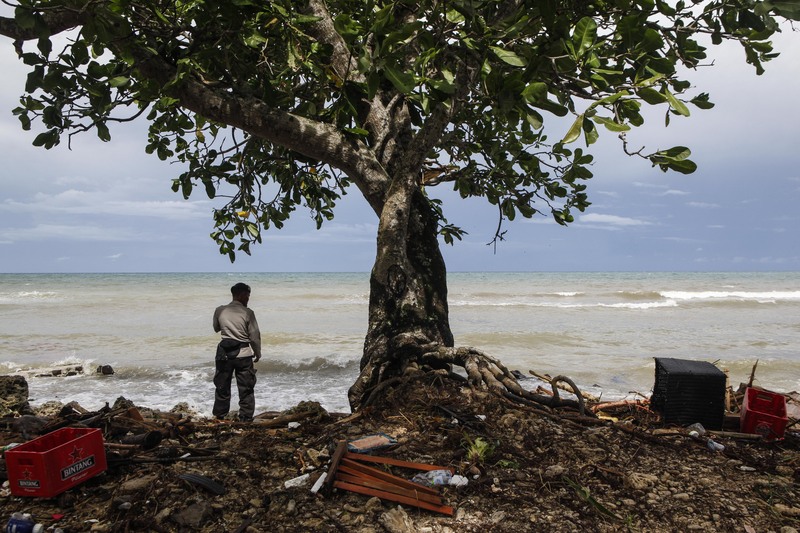 Rescuers identify bodies of victims after a tsunami hit in Tanjung Lesung, Banten. 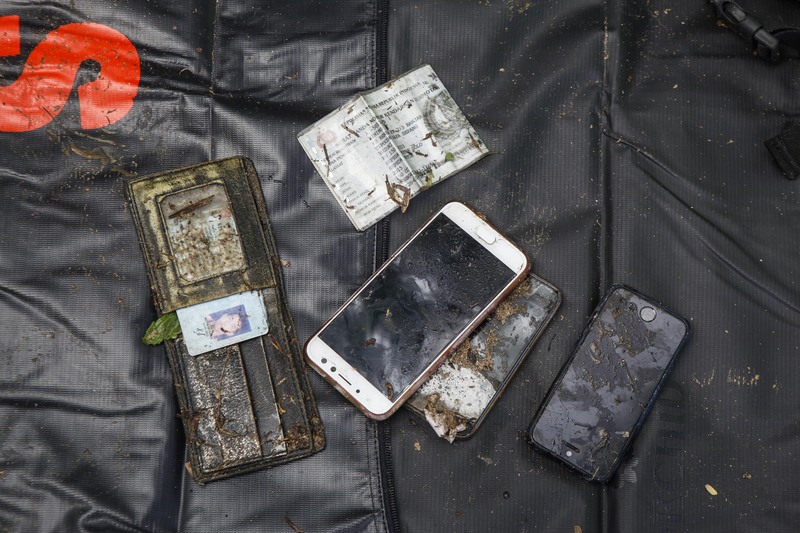 Mobile phones, wallets and ID cards belonging to the dead. 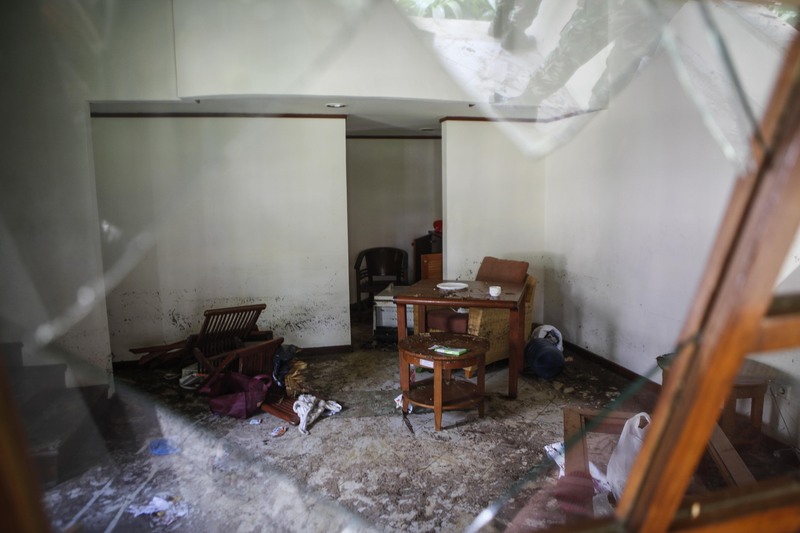 The conditions inside a room at one of the devestated luxury hotels in Tanjung Lesung, Banten. 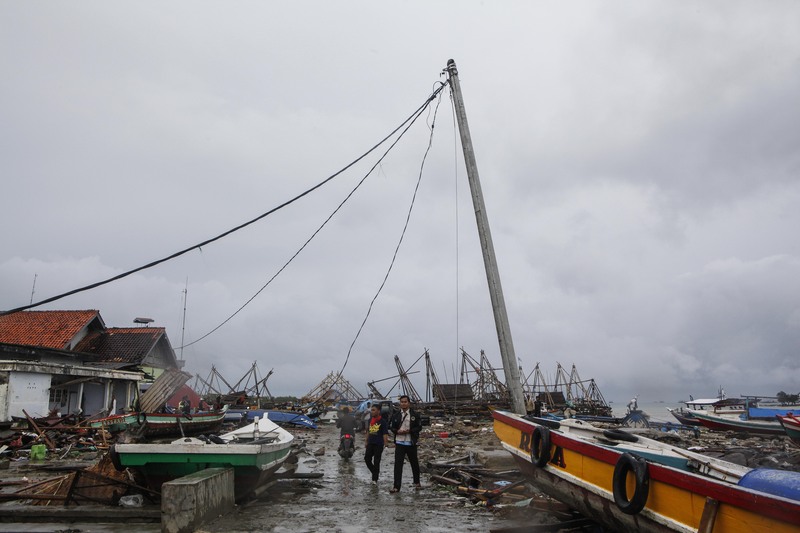 Boats were carried by waves into residential areas in Sumur, Banten. In the affected areas, electricity was cut off due to collapsing poles and broken cables. 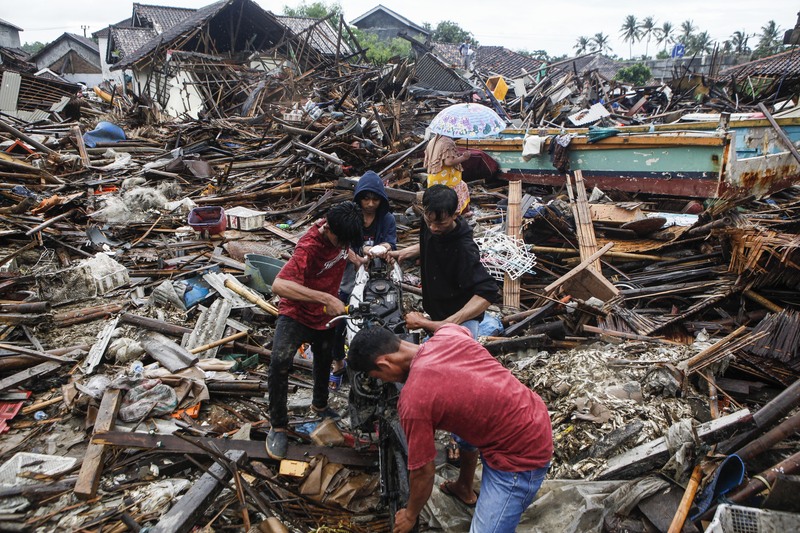 Local residents evacuate a damaged motorbike among debris in Sumur, Banten. 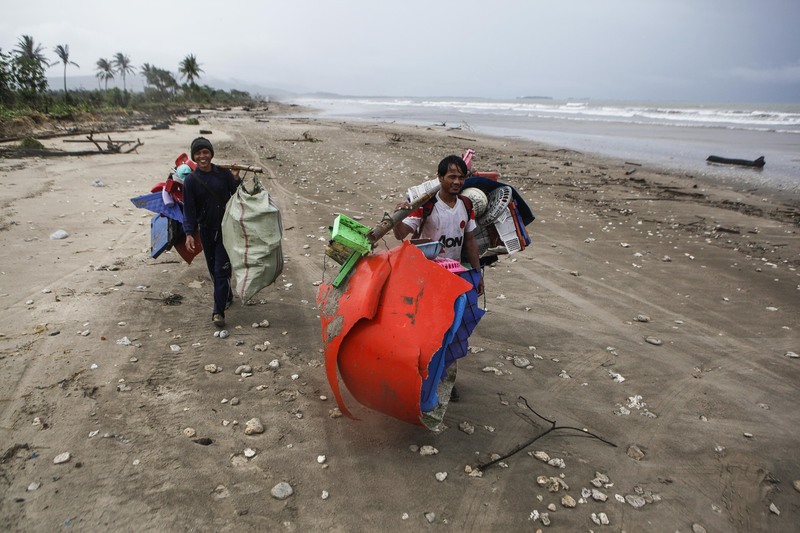 Local residents walk on the beach carrying items collected from the coast in Sumur, Banten. 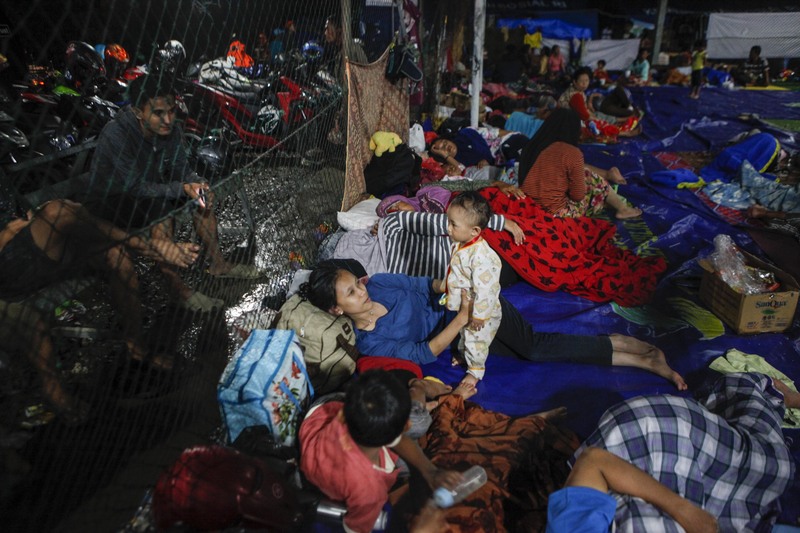 Survivors using a futsal field as a temporary shelter in Labuhan, Banten. 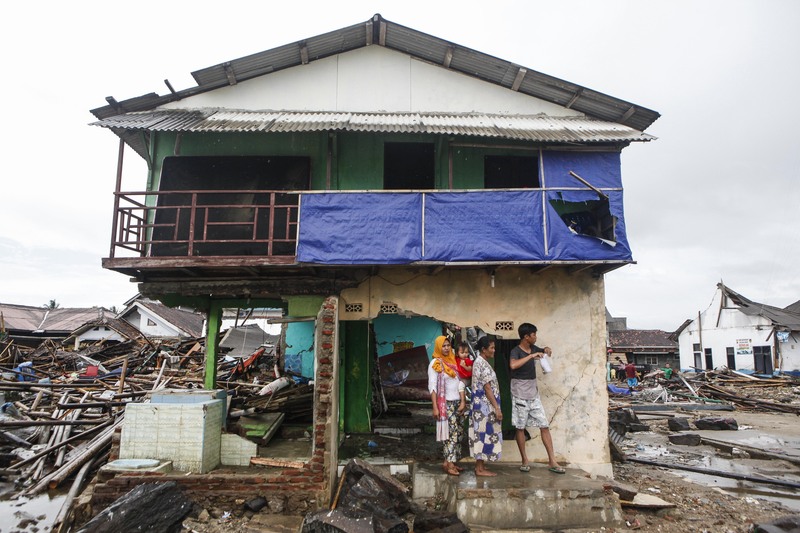 A family in front of their collapsed house in Sumur, Banten.